What are Mysterious Morphing Experiments (MME's)? How do I know if an item is part of the Mysterious Morphing Experiment? All the items that are part of the MME have a question mark in their right corner. Also, their names will be starting with MME like in MME1-S1: Tiny Striped Wonderworm. MME1 means this item is the first Mysterious Morphing Experiment item that appeared; the S1 means that this is Stage 1 for the item. A name like MME4-S6: Magical Winter Wand means this is the sixth morph of MME4. MiniMME's have there name always started with MiniMME, followed by a number and stage as well. What are the experiments and results so far? Click on the MME of your choice to see how it has evolved. 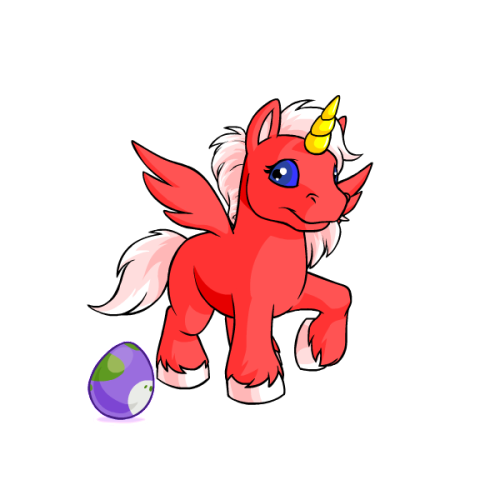 This item is the bonus of MiniMME3-S1: Whirling Purple Speckled Negg. How long will it take before the MME (or MiniMME) starts to morph? All MME's and MiniMME's won't morph as long as they're being sold in the NC Mall. Right after they retire and are no longer being sold, MME's starts to morph. At this stage, MiniMME's will be done morphing right away, regular MME's however can take several days or even weeks to morph into another stage. Most regular MME's have to morph into four or 5 different stages until they are finished morphing. All MME's with the same name will morph at the same time. It's not possible for one to morph right away, while the other takes as few weeks. How do I know when an MME's in done morphing? When an MME has reached it's final stage and is done morphing, you'll see how there is no question mark on the picture anymore. Within a few hours, all the previous stages of the morph will appear in your inventory as well. Yes that's right, you do not only get the final stage of the MME, but also all it's earlier morphs. Can I trade or gift a (Mini)MME? As long as you've got NC Giftboxes, you can use those to send the MME to someone else or trade with it for other NeoCash items. When you trade or gift a MME, the person who received it, will receive all the previous stages of the MME when it's done morphing. These stages can be traded like normal Neocash items as well. They won't start morphing again when traded however. 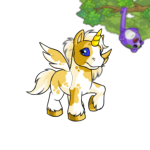 Like all Neocash items, you may never trade an (Mini)MME for neopoints or neopoint items. This could get you account frozen! Why does each MME has an A and a B version? To add to the excitement of morphing, somewhere during the morphing process, the MME will split into different stages. Most of the times, this happens at the end of the morphing process, the MME2 is the only exception on this, it morphed into two different stages already with the second morph and split up again later on. How can I find out what item ID my MME has? For this there are several methods. 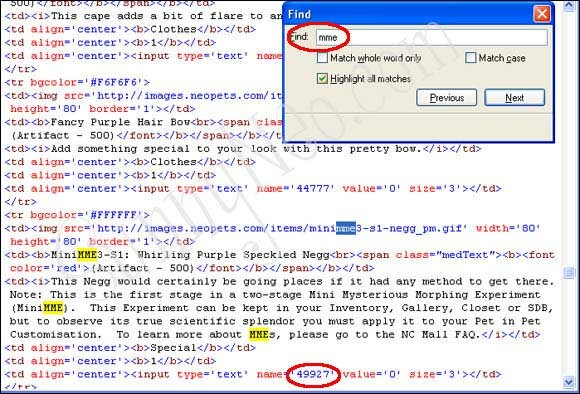 This method works in Firefox and Chrome, but not in Internet Explorer, Safari or Opera. 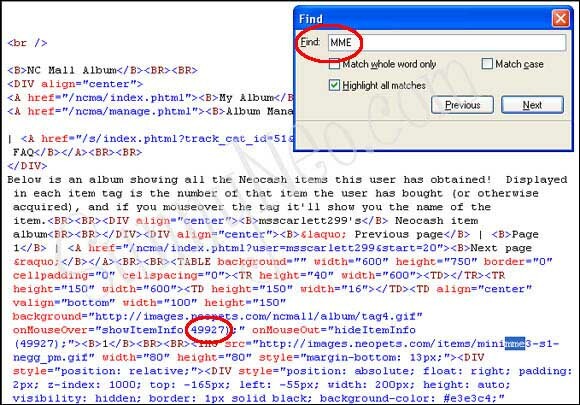 Add the MME to you shopping cart, then select the name and image of the MME. Right click and choose the option 'view selection source' in Firefox or 'inspect element' in Chrome. You should now see something like 'img id="49927"'. This means you've found one of the ID Numbers. For the second one, the last two digits will be different. 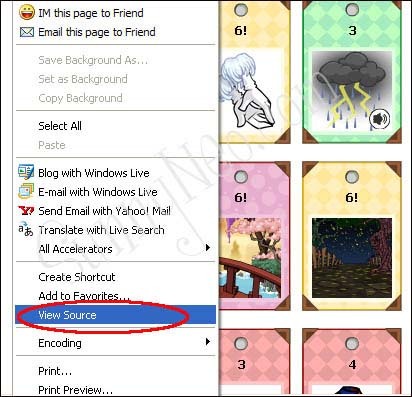 By viewing the ID numbers of more MME's you can find out what MME's items are around. Most of the times, an MME has two different ID numbers. Also, so far, the lowest MME number has always given out the a item and the highest the b. This is however no set rule and it could very well change in the future. If you want to buy an MME with a specific ID number, place a few (at least two) MME's in your shopping before you view the ID numbers. Later on, you can remove the ones with the ID number you don't want. For this there are several methods as well. - Checking in your NC Album. For this, you look up the MME on you NC album. Then you right-click on your NC Album and choose 'view source'. A window will pop-up showing the coding of the page. In the window, use CTRL+F to search for 'MME'. A bit above where you've found the MME, you'll see something like this: 'ItemInfo(49928)', again here, the last two digits will tell you which version of the MME you have. You can use the same method to check in you closet as well. This time however, you'll find the info you need in the source coding slightly below the description of the item, saying something like name='49928'. - Checking in your Safety Deposit Box. Search for the MME in your SDB, then hover over the 'remove one' link. In the status bar at the bottom of your browser, you'll see something like this: (0,49927,'MME''0). These methods works in all browsers. The ID numbers used here are the IDs for the MiniMME3-S1: Whirling Purple Speckled Negg. How can I know whether I'll get a bonus item or not? Bonus items are awarded randomly. You won't know whether you'll get one until the previous stages of the MME appear in your inventory. Only then, when it appears in your inventory, you'll know wether you've gotten a bonus item or not. Bonus items are rare. It's possible to buy only one MME and get a bonus item with it, or buy ten of them and not getting any bonus item at all. Can all Pets wear MME's? Yes, but the colours who normally can't wear any clothes, like Maraquan, Mutant, Baby, invisible and fruit and vegetable Chia's and unconverted Pets can't wear those items that are zoned as clothes, only the trinkets and backgrounds. 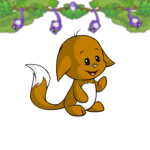 Does an MME need to be worn by a Pet in order to morph? No, when kept in your closet, SDB, gallery or inventory, the MME will morph just as well as when worn by a Pet. However, being worn by a Pet an MME is more fun to look at. If you have any additional questions on this guide feel free to neomail phoenixs_angel. However, if you are looking to submit a bug report or a suggestion relating to this guide, please check this page instead.